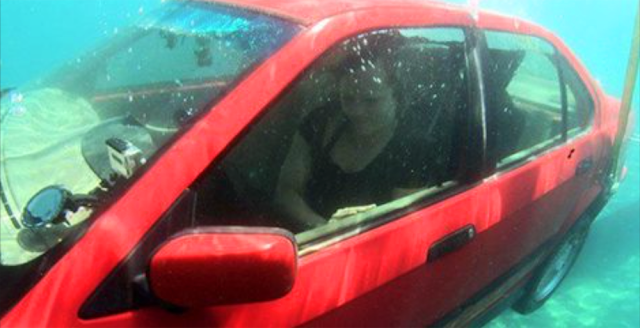 For many of us, the thought of being trapped in a sinking car has crossed our minds. What would we do, how would we react, would we be able to make it out alive? That kind of stuff is what nightmares are made of, but for some people that nightmare could one day become a reality. Think about it, all that it takes is one brief moment. Perhaps you’re driving down the road and become distracted, when you look up it’s too late and you end up crashing into a pond. Or maybe a deer suddenly pops out of nowhere. Without even thinking you instinctively swerve to avoid hitting it and in the process you end up losing control of the car. If you end up in a lake, river, stream, marsh, or whatever body of water it may be, your car is going to immediately start sinking. Water will rush in and it will quickly begin to fill the interior passenger compartment space up. What do you do? Many people have no idea what to do if they find themselves in this type of situation. As much as you may have thought about it, when it comes down to it you’re likely panicking and not thinking about what the best course of action is. The obvious thing you’ll want to do is get out of the car as quickly as you possibly can. To help yourself escape as fast as possible, the first thing you should do is roll down the window while simultaneously taking off your seat belt. Rolling down the window and removing your seat belt is crucial because all that water may cause the computerized electronic equipment in your car to short out or completely malfunction. If that happens, you will likely be unable to roll down electric windows or disengage your safety belt. Being trapped in a sinking car with the windows up is virtually impossible to escape from. At that point you’d need to break a window to get out. You won’t be able to open the door, even if it is unlocked the sheer pressure from the surrounding water makes it impossible to force open, you’d basically need to have superhuman strength. Only a special tool designed to break car glass windows will work. You can find these online and keep one in your car, but overall the best option is to roll your window down asap! Never call 911, you will be wasting precious time where you should be escaping and it will be too late by the time help arrives. Don’t panic. You have to react immediately and freezing up will get you killed. Every second counts and the instant you hit the water the clock starts ticking. Watch this ABC News clip. It will show you exactly what to expect if and when you should ever have to escape from a sinking car. It also offers an inside-view of what a sinking car will look like and the experts take us through a number of scenarios. They show you how to get out from the front drivers seat, from the rear passenger seat, and how to help get little kids out as well. Please Share this article and video with friends and family. The information that it contains could possibly end up saving your life one day or that of someone you love.